So, what is Color Theory? Why do we need to study it? There is a lot of information available on the subject for web designers, interior designers, fashion designers, make up artists… and other similar professionals. We will concentrate on this information in Color Theory for Painters. 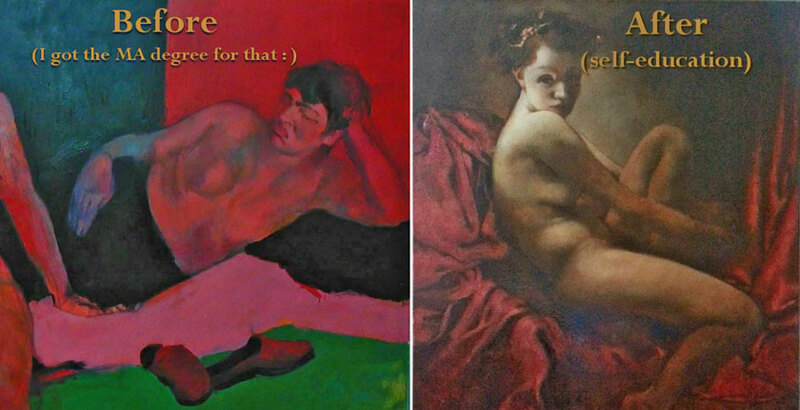 Have a look at these fascinating Color Theory exercises. 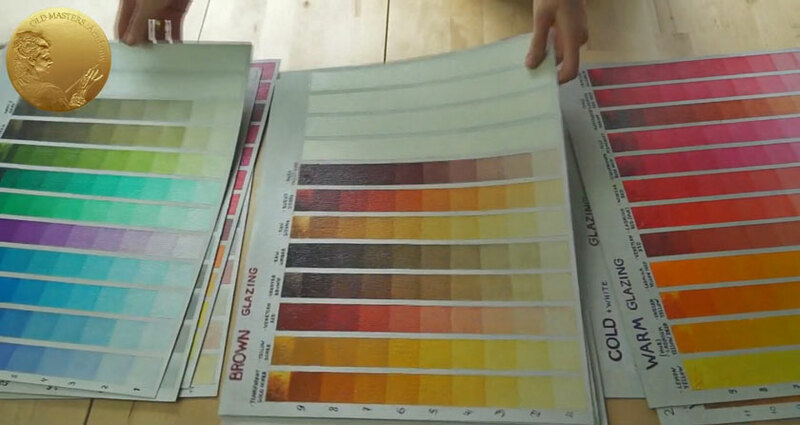 We are going to create some illustrative charts and swatches to acquire better experience in Color. We will shift our understanding of Color from plain intuition to the level of proficient color manipulation (manipulation in it’s best meaning). We need to frequently test our Palette Colors, especially when we are beginners. Test various Colors, alone or in mixes, and Test their opacity to understand the practical difference between opaque and transparent Colors. This section is dedicated to Color Theory for Painters. You will learn a lot about the Colors you are going to use in our paintings and such samples can serve us as a useful reference during the painting process. Some artists look at Color Theory condescendingly, as if it is just an optional discipline, as if it didn’t have a big impact on the creation of painting. However, Color Theory is not a modern invention – Color Theory principles first appeared in the writings of Leone Battista Alberti in the beginning of 15th century. 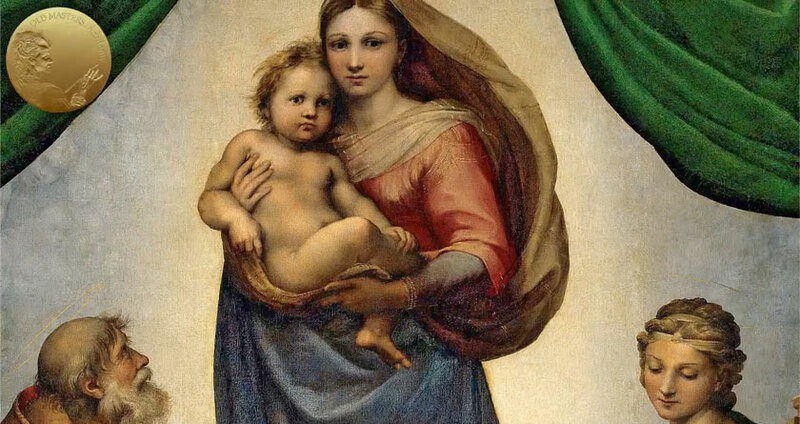 Leonardo da Vinci also paid attention to the properties of Color. Proof can be found in many of his numerous notebooks. 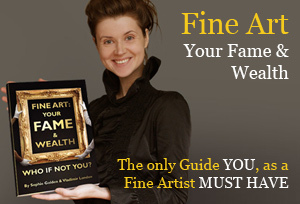 Many contemporary artists believe working with colors is intuitive and plain. In my experience, many years passed before I understood that I have to really explore the potential of my Palette with simple, but effective Color exercises, such as Color Swathes creation. 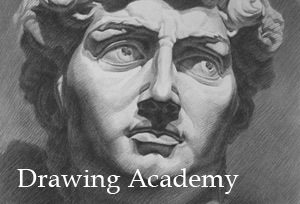 Now, it seems so weird to me, that it’s possible to spend 6 years in the Academy of Fine Arts, a very prestigious and authoritative establishment, and not being taught Color Theory at all. After graduation, I self-educated myself in order to understand the power and the abilities of Colors. Since then, my level of painting skills has risen dramatically. Also, I actively advocate that Color Theory should be learned with a heavy emphasis in all Auxiliary Disciplines that we, artists, should master. Earlier or later, even stubborn and overconfident artists, come to the conclusion that they must explore the potential of Colors in order to increase their progress in painting. If you want to avoid wasting paint and your precious time painting muddy dark artworks, you are welcome to do our Color Theory exercises. I wish I had an opportunity to practice such exercises when I was a student. Studying Color Theory is a lifelong process. 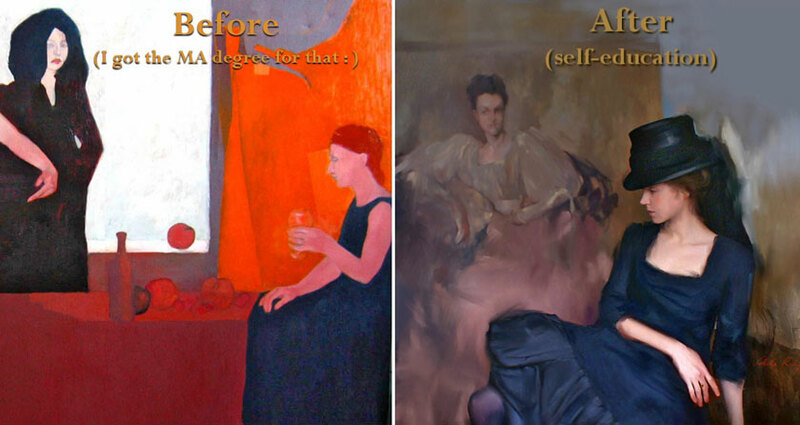 Basics should be mastered at the very beginning of your artistic life; however, you will constantly discover new and interesting Color combinations and new surprising Color effects throughout your painting career. Working with Color charts will help us control the colors in our paintings. We will better understand Color and we will be able to predict its behaviour (on it’s own or in mixtures). We will also understand how the manner of applying Color can help us create different effects; for example, applying paint opaquely or thinly leads to different visual results. The Color Theory exercises will answer many questions such as how to manipulate Hue, Value and Intensity of Color and will clarify what these terms mean. Color Theory exercises will also address how Colors affect each other and will show us how to balance Color. 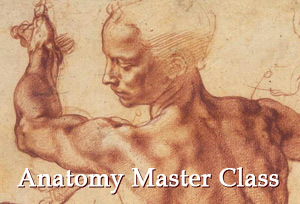 The challenge of mixing Colors will also be considered in the Old Masters .Academy ™ Course. There isn’t a wrong way to mix colors, however we can divide mixing into effective and not effective. This is also a topic for further discussion. You do not need to memorise mixing formulas, everything will be based on Intuition supported by Knowledge of Color properties. And there is nothing that sharpens your Intuition more than Colors Theory exercises and practice. Each Color has its individual properties and we should familiarise ourselves with them. Of course, due to various application methods, there is an infinite number of diverse Color mixes and color effects. It isn’t possible to explore all of them in our exercises; as we do not need to learn all combinations of words in order to compose sentences. These charts are like Vocabulary fundamentals from which you derive long sentences and in the course of time, you will learn how to compose complicated color compositions. I must admit, these exercises take time. However, thanks to these practical self-exercises, you will learn how to use even a limited Palette in a much smarter and more productive way. Color Theory is a discipline you could study for a lifetime and still discover new things. Since Aristotle, people tried to understand Color. Among the brightest names are the English scientist Sir Isaac Newton and … surprise, surprise – Johann Goethe, whom we know as the great German writer and the author of immortal “Faust”. He also was a renown scientist leaving to us his profound treatise “Theory of Colors”. At our disposal, we have relatively inexpensive colors and just about any possible color we can imagine. We take this abundance for granted. It would be difficult to imagine our art shops only selling just a few pigments. But that was the reality of the Old Masters and as we can see, they coped magnificently with such a modest selection of Colors. From their Limited Palettes they created such a rich and full colorful language; the Vocabulary of their Colors was so profoundly vast, that the phrase “Limited Palette” should have a symbolic meaning. These lightweight swatches are very convenient to store. They are also very mobile. You can take them on a trip and refer to your swatches when you are attempting to create the right tone to use in a painting. However, it’s not quite right to be fully dependent on your Color Theory Charts, they are there to help – just as a reference, from time to time. With time, you will not need to refer to the chart often; you will instinctively know the properties of a particular color. Until then, keep the chart at hand during the painting process. It is essential that you do your charts yourself, do not rely on the charts I provided you here. First of all, the visual impression of Colors on the charts may be skewed. A computer can’t present an image precisely (each computer shows colors in slightly different ways, depending on the computer’s color calibration). Your personal charts, in your hands, show you colors that are much more precise. A second reason is that identically-named Oil Paints, for example, French Ultramarine, can slightly vary in Color from one brand to another. This includes even Professional brands. I do not know the brands you choose to use, so it is important to test your Colors yourself. And one more point needs to be clarified. In case you already have a collection of Oil Paints which accumulated over time, you can test each paint. In these exercises, I showed you how to do so. I recently demonstrated how you should test your Palette and judge and compare the visual characteristics of each color. For beginners who just want to acquire Oil Paints, I recommend the Oil Paints Palette that I use myself. 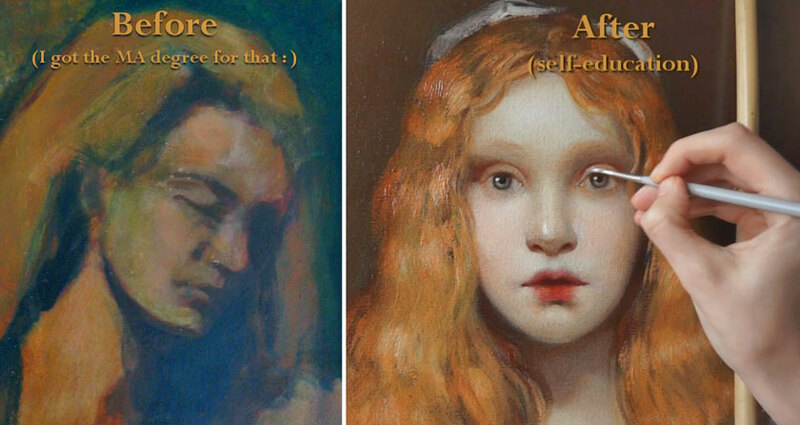 All demonstrations you will see in the Old Masters .Academy ™ Course are based on this Palette.